Look how much Fielding University Press has accomplished since it launched earlier this year! 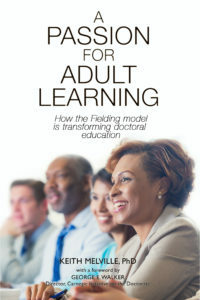 A Passion for Adult Learning by Keith Melville is a fascinating chronicle of Fielding’s genesis, and how its unconventional model for adult learning has been adopted and imitated by mainstream universities ever since. The book was published earlier this week with rave reviews from, among others, George E. Walker, director of the Carnegie Initiative on the Doctorate, and Alan E. Guskin, president emeritus of Antioch University. 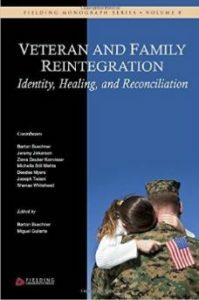 Veteran and Family Reintegration, edited by HOD faculty Miguel Guilarte and Fielding alumnus Barton Buechner, brings together seven studies on the often “unseen injuries” suffered by veterans and their families. This includes the idea of moral injury, the stress of family integration, and the loss of one’s identity as a result of physical trauma. The book has been featured on several radio shows and will also be presented at the upcoming Summit on Psychological Health and Traumatic Brain Injury. Isabelle Harman served as the book’s editorial coordinator. Clinical Health Psychology: Cultural Perspectives is edited by Clinical faculty Ray Hawkins with Ydalith Rivera-Perez as editorial coordinator. The book brings together a number of peer-reviewed chapters on clinical health and wellness psychology, based on new research by Fielding graduates. The target publication date is November, 2016. Contemplative Social Research, edited by Valerie Bentz and Vincenzo Giorgino (University of Turin), brings together 11 chapters from scholars around the world on theories of self, mind, culture, and society. The University of Lodz, the University of Basque Country, the Universidad Autonoma de Barcelona as well as Drexel, Claremont, and U. of Pennsylvania are some of the institutions represented in this important work — as well as contributions from our own Annabelle Nelson, Rick Moody, and Valerie Bentz. The book is slated for publication in November, with Casandra Lindell serving as editorial coordinator. Archetype of the Absolute: The Coincidence of Opposites in Mysticism, Philosophy and Psychology is written by Clinical faculty Sandy Drob. It traces the history of opposite ideas, and develops the thesis that apparent conflicts in philosophy, including competing paradigms in psychology, are often more complementary than contradictory. The foreword is written by Paul Bishop of the University of Glasgow. The book is slated for publication at the end of this year. Attention Fielding faculty: The current Call for Book Proposals ends soon! If you have an idea for a book about your research or shared research with your students, alumni, or colleagues at other institutions, send a brief description to jisbouts@fielding.edu by Sept. 15.